After a quick change of racing venues this past weekend, the cross-country teams traveled north rather than south as planned. 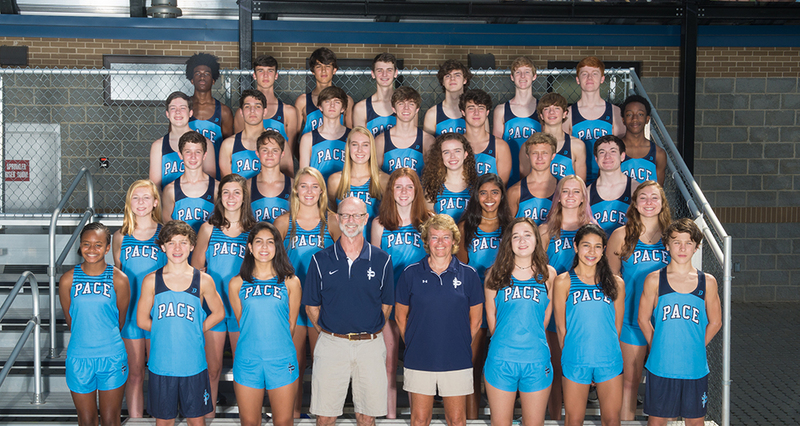 Hurricane Michael caused too much destruction for the Westover Invitational to take place in Albany, so the Knights trekked to Pickens County High School to compete. The varsity boys put in their best team effort to date. Junior George Adams led the team with a time of 16:58, followed closely by freshman George Blaha (17:07), junior Quill Healey (17:08), freshman Edward Blaha (17:09) and freshman Robert Mallis (17:12). The 14-second spread between the Knights' top five runners was incredible, and junior Sam Adams (17:22) came in sixth for the Knights, extending the spread to just 24 seconds! Robert Houser (18:29) rounded out the top seven. The Knights' eighth-, ninth- and 10th-place finishers were freshman Grant Thompson, senior Drew Schiffer and sophomore Alexander Swann, respectively. The boys finished third overall behind powerhouses Pope and West Forsyth High School. The varsity girls had an incredible day as well. Junior Paula Sandoval continues to push the pace. She finished in 19:50 and was seventh overall. Freshman Laura Arenth (20:42) moved up the ranks and placed second for the team. Sophomore Laura Romig (20:45) and junior Payton Payne (20:47) followed. Sophomore Kathryn Hood (21:15) rounded out the Knights' scoring top five. Freshman Jordan White (22:12) was the team's sixth-place runner, while freshman Margo Kaye (23:09) was seventh. Due to a mix-up in the results, the Knights placed fifth, but once the results are recalculated, the record should show the girls finishing third or fourth. The Knights' eighth-, ninth- and 10th-place finishers were junior Sophie Lettes, senior Carly Irvine and senior Justice Jackson, respectively. This meet concluded the regular season. The Knights now have their sights set on the region meet on Oct. 24 at Westminster, where they would love to have huge fan support. Details on the region meet are forthcoming. On Lovett's senior night, the Pace seniors made it an evening for the Lions to forget by shutting down the Lovett offense for a 17-13 road victory! It was the Knights' second win over the Lions in as many years and brought the Class of 2019's record over the neighborhood and region rival to 3-1. The first quarter was a chess match, with each coaching staff trying to get a feel for what might work against the other. 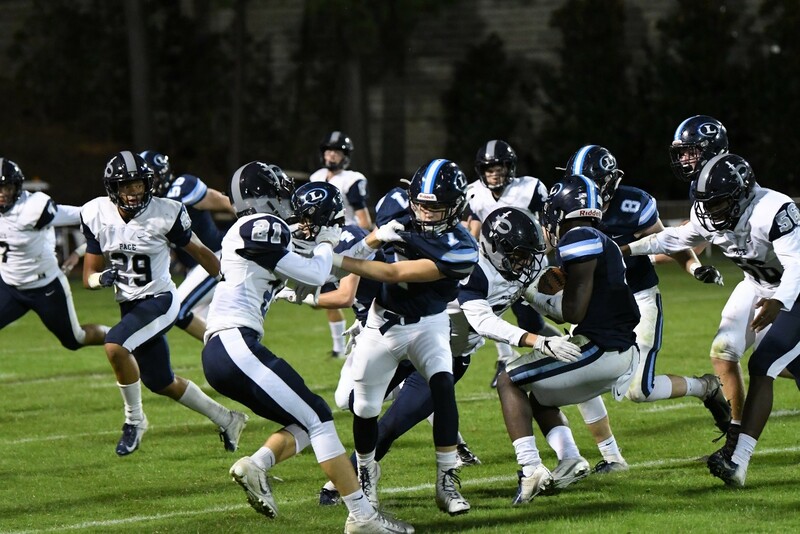 The Knights defense, led by seniors Parker Spillers, Ahsan Hennings, Deron Moore, Chase Karamanolis, Sam Assaf and Cameron Hamilton, harassed and hammered the Lions' running backs and receivers all night and forced Lovett's quarterback to scramble or throw off balance. Junior linebackers Ben Caldwell, Will Rehmert and Sam Harris, as well as freshman Xavier Agostino, backed up the seniors with aggressive stunts and tackles. The Lions managed one touchdown and two field goals, both of which came after huge Knights' defensive stands inside the 10-yard line. The Knights never trailed in the game. Offensively, senior quarterback Jared Rayman was a true leader, orchestrating long drives with precision passing, great decision-making and deft running when the Lions least expected it. After the first quarter, Rayman led the offense to a second-quarter field goal attempt, which senior Patrick Markwalter calmly booted from 52 yards! The next drive led to a beautiful pass and touchdown catch by sophomore Jayden Thomas, giving the Knights a 10-7 lead. The Lions threatened at the end of the half, but the defense stiffened to give up just a field goal to make it 10-10. In the second half, the Knights offense ate up the clock as the offensive line, led by senior Chilton Tolliver, pummeled the Lions into submission on their own field. Following another beautiful fade pass and catch to Thomas at the Lion's 1-yard line, the Knights punched it in for a 17-10 lead going into the fourth quarter. The rotation of senior Keashawn Perryman, freshman Deuce Jordan II and sophomore Justin Johnson thrashed the Lions defensive line. The Lions had little time to try to make a comeback, and their last pass attempt on fourth and long was broken up by junior Jimbo Smith before the Knights ran out the clock for an amazing 17-13 victory. Next up: Senior Night on Friday, Oct. 19, vs Cedar Grove at Walsh Field. Please come out to support the team in this Region 5-AAA showdown. 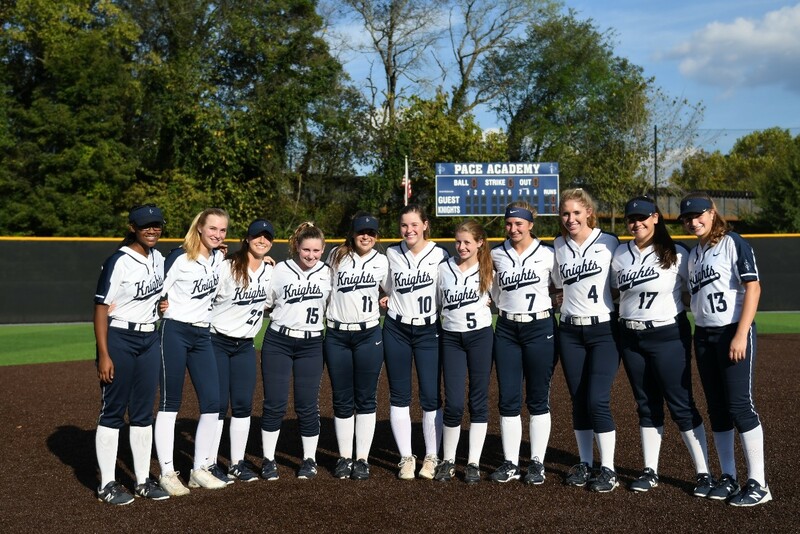 On Oct. 10, the varsity softball team headed to Carnesville, Ga., to take on Region 8's No. 2 seed, Franklin County High School, in the first round of state playoffs. The double header ended with 0-15 and 0-14 scores. The Knights were unable to put up any runs and struggled defensively, allowing both games to end in mercy rules. Despite the injuries of junior Molly Buffenbarger and sophomore Marissa Goodman, and a roster of only nine players, the Knights fought through the battle. Senior Caelan Corbally brought life to the team, blasting a double to centerfield, but the Knights were still unable to gain momentum offensively. Junior Caroline Landis and sophomore Lily Koch both singled for the team as well. The Knights ended their 2018 season 9-3 in the region and 13-11 overall. Thanks to the coaches and fans for an outstanding season! The Knights hosted Lovett in the area tournament on Oct. 10, and the Lions came to play. Junior Lucy Ferry returned to action after a six-week absence due to an ankle sprain. Her presence made an immediate impact on both attacking and blocking. The first set saw Lovett pull away late and win 25-19. The second set appeared to be more of the same, with Lovett pushing Pace point after point. However, leading 24-21, Lovett seemed to relax. Pace quickly took advantage and ran off five straight points to win the second set. Pace was determined to play a better third set, and it showed. The Knights took a commanding 13-4 lead before the effects of Hurricane Michael shut off the power in the Inman Center. After a 15-minute break, play resumed, and Pace didn't miss a beat. The lead continued to build, and Pace went on to a 25-10 win to take the match. Highlights included junior co-captain Ada Jane Agolli with 16 kills and a .414 hitting average, Ferry with a team-leading three blocks, and sophomores Hannah Pace and Kalissa Greene with a team-high eight digs and 26 assists, respectively. Pace then traveled to Westminster on Oct. 11 to take on the Wildcats in the area championship match. The rivalry did not disappoint; the match turned into an epic battle. Westminster took an early lead in the first set with dynamic attacks, but Pace answered to close the gap. Pace was able to win big points late to take the first set 25-23. The second set was close early on, but Pace pulled away at the end, winning 25-19. Both sides were expending a lot of energy, and it showed in the third set. 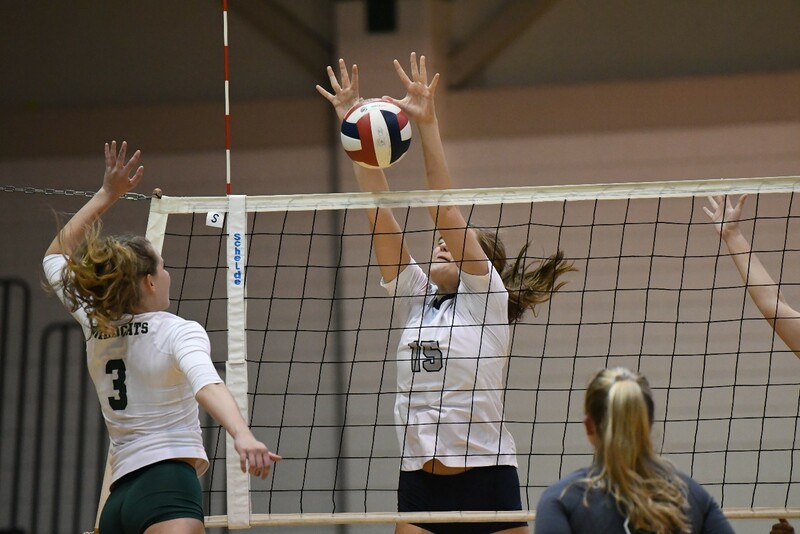 Pace was unable to match the first two sets' level of play, and Westminster took a commanding lead and cruised to a 25-12 victory. The fourth set, however, showed a very different Pace team. After trading the first few points, Greene elevated her service game, and Westminster could not answer. Pace closed out the set and the area championship with a 25-10 victory. Greene led the team with 22 serves and five aces, along with 17 digs and 40 assists—an impressive performance! Senior co-captain Alexandra Baker had one of her best matches of the year, hitting .391 with 27 kills. Add to that a tremendous defensive performance with a team-high 96 digs. Next up: Pace will host the first round of the state playoffs this Saturday, Oct. 20, in the Inman Center. Match time is yet to be determined.